This is Patrona our first mini-nubian doeling pictured at one month old. She is 29.69% Nubian/70.31 Nigerian. She is a quadruplet! She has blue eyes. Hermione is a naturally polled purebred mini-nubian with a nice pedigree. She has great breed type. Her sire Gilles was moonspotted. This picture makes her look like she has lift to her ears-she does not, she has gorgeous long ears which she has passed on to her kids. Dotty is a petite nubian doe only standing just 23.5" at the withers. 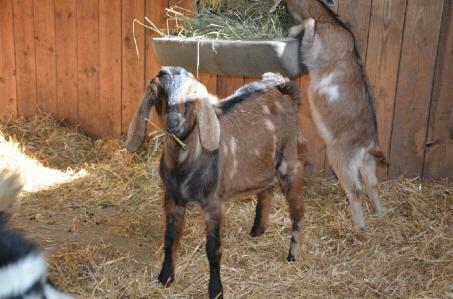 We hope to add some good nubian character and color to our mini-nubian herd with Dotty!